You and your family are herders, looking after larger flocks of sheep. Your grandfather is the leader of your tribe. One day your grandfather says that your whole family will be moving to a new country where there is more water for your sheep. The trip will be long and difficult. How you do you feel about moving to a faraway land? Miss Morris will explain the connection between what the students already know and what they are going to learn next. What beliefs do you have and what do you live by? Students will compare and contrast their life to that of the Israelites. Students will have opportunities to compare their beliefs with that of the Israelites and how their life is similar and different to the lives of the Israelites. Students will begin by imagining that they were living in that time period. How would they feel? What would they be thinking? What is Judaism? What is the Hebrew Bible? How was Abraham? Who was Moses? Why were they so important? How did the Israelites shape their society? What did they believe in? King Saul, King David, King Solomon – why were they so important? What were the women’s roles in society? How does this compare with our society? The students will take part in several different writing prompts throughout class and will be graded on their active engagement and participation. ​Homework Thursday and Friday, October 4 and 5, 2018: Read pages 86-88 in the workbook and answer ALL questions on these pages. How will you explain your belief in kindness? Today you will learn about Jewish beliefs and the different texts their society had. What was Jewish education like? What is the difference between justice and righteousness? Homework: Read pages 86-88 in the workbook and answer ALL questions on these pages. Homework Tuesday, October 9, 2018: Read pages 86-88 in the workbook and answer ALL questions on these pages. What were some of these laws and beliefs? How did this influence their life? Students will identify different reasons why the Jews acted like they did and why those events were important. Miss Morris will explain what we will be learning today: Today we will be beginning the first step of the poster that we discussed yesterday in class. 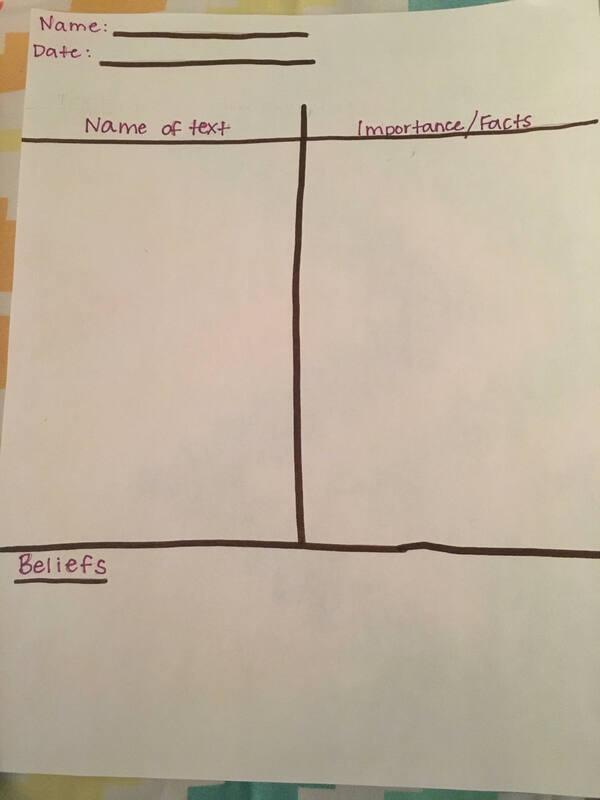 Today you will be handed a graphic organizer asking you to name the texts and beliefs and WHY these are important. Students will be graded based on their active participation in class and in their engagement with the text and with the graphic organizer. If you were there… “Foreign soldiers have taken over your homeland and are forcing you to obey their laws. Some people are urging you to stand up and fight for freedom. Your conquerors come from a huge, powerful empire. If your people revolt, you have little change of winning. Will you join the rebellion? Why or why not? Today you will learn about different revolts, migration, cultural traditions, and how Jews celebrate their holidays. What are Zealots? What did they do? Were the Jews successful in the revolts? Who were rabbis? What were their jobs? What customs were different after the dispersal of the Jews? ​Essential Question: How did the Hebrews defend themselves and maintain their beliefs? What you will learn: In this chapter you will study the history and culture of the Jewish people. The Big Idea: Originally desert nomads, the Hebrews established a great kingdom called Israel. The Big Idea: The central ideas and laws of Judaism are contained in sacred texts such as the Torah. The Big Idea: Although many Jews were forced out of Israel by the Romans, shared beliefs and customs helped Jews maintain their religion. 3. Identify key steps in a text’s description of a process related to history/social studies (e.g., how a bill becomes a law, how interest rates are raised or lowered). Analyze features in the text to further your understanding of maps, settlement, and specific routes taken by Jews by their leaders. Evaluate specific vocabulary and why it is significant to Israelite history. Question: What is Judaism? Analyze the picture on 199; what are your questions about this picture? Examples: Refer back Graffiti Board Judaism: What can we add? Why is this topic academically important to learn? How would you feel about moving to a faraway land? Leaving everything you know to go out to the unknown just because you were told to? (Add in some background about Abraham… Abraham was told by God to move to a faraway land. Does anyone have any reasons why this lesson is important academically? Contribution: Abraham was told by God to leave Mesopotamia and go to Canaan. This shows obedience. Ms. Taggart wants to make sure that the students are completely prepared for the assignment before students begin to work independently by asking students if they have questions about the power-point or chart they are to fill out. Have the students met the objectives? What characters from this section helped to establish the land of Israel? Read Pages 208- 213 and answer the question: "What are the beliefs of Judaism?" in RACER format. New York State Next Generation English Language Arts Learning Standards: 2. Determine the central ideas or information of a primary or secondary source; provide an accurate summary of the source distinct from prior knowledge or opinions. Evaluate specific vocabulary and why it is significant to Jewish history. What is the definition of a belief? Think of your major beliefs. Filling in the “R”, “A”, and “S” parts if applicable!! Ms. Taggart will go over the expectations of the Dead Sea Scroll project. This will be in class. They will have two days to complete it! To fully comprehend the beliefs of Judaism. Students share their responses with class. Mrs. Taggart will explain the connection between what the students already know and what they are going to learn next. Big Idea: “Although many Jews were forced out of Israel by the Romans, shared beliefs and customs helped Jews maintain their religion.” (p.214). Students will observe the power-point and take notes in their social studies notebooks, on each slide to further their understanding of the chapter. Students will explain what Hanukah, Passover, and The Holy Days are, and why it is important to Jewish tradition. They will do this by using their text book pages (218-219) and internet sources to answer the given questions on the slide 7. Pausing when needing to further explain something or show a visual to keep students engaged. Ms. Taggart will show important videos and photographs to show students what visual examples represent this chapter, and how they connect to what we are learning. Students will complete a Migration worksheet: Mapping out the route in which the Jews traveled when migrating away from the Holy Land. Students will write a 4 paragraph essay on loose leaf paper answer the questions posted on slide 7 of the power-point. Are students able to correctly describe the big idea that was just taught? Review all vocabulary words from the unit. Homework Due Tuesday, February 28, 2017: Complete pages 200-201, Facts and Opinions about the Past, questions 1-4. What is "Judaism"? Students will write down their thoughts. Students will peruse pages 199- 221 in their social studies text book, jotting down questions that they might have about the chapter. Students will also analyze the photo on page 199. What questions do you have about the photo or chapter? Now what comes to mind when you hear the words "Hebrews, Judaism, Jews"? Why do we study ancient Hebrew history? Facts and Opinions about the Past: Complete pages 200-201 together in class. As a class, we will read pages 210-213 and discuss the important Hebrew texts. If Mrs. Looney were to create a PowerPoint of the Hebrew texts what images would she include? What texts would she include? What facts would she include? Using the work from pages 208-213 and today, students will write the main Jewish beliefs on a scroll. · Students will create an example of a scroll. · Write your information using at least two different columns. · In one of your columns, list and describe all of the Jewish texts that are mentioned in the social textbook. · In another column, list and explain the Jewish beliefs. · You will be graded for accuracy of facts, the amount of evidence you provide, and neatness. This is to be competed for homework and is due on Friday, March 3, 2017. The Chapter 7 Social Studies test will be on Thursday, March 9, 2017. Be sure to begin studying! Review the Guided Reading Worksheets. Students will begin to work on the Test Review Sheet. It may take several days to complete this sheet. BE SURE TO BE WORKING ON THIS SHEET EACH NIGHT IN ORDER TO COMPLETE IT BEFORE THE TEST ON WEDNESDAY. THE REVIEW SHEET IS DUE ON TUESDAY, MARCH 7, 2017. Students may want to use the computers in study hall or use a computer at home to use the flash card websites and Quizlet as well as play some of the study games that are listed above at the top of the page. Homework Due Wednesday, March 10, : Reading Check pages 216, 218, and 219. Begin working on the review sheet. Review Sheet is due on Thursday, March 12, 2015. Classwork: Monday, March 9, . Students will read pages 214-219 in the social studies textbook. Students will complete Reading Check on pages 216, 218, and 219. Due Monday, March 6, 2017: None. Students will share their scrolls with the class. Students will annotate as they read pages 76-78, The Hebrews and Judaism, Section 2. Follow the instructions in the margins of the worksheets. Students will have the end of the class period to work on this assignment. Finish the work for homework. These Guided Reading Sheets will be great resources to use to study for your test. Homework Due Thursday, February , : Venn Diagram, Leaders in Jewish History, pp. 202-205, complete in social studies notebook. As a class, we will read pages 202-204 in the social studies text book. Notice that the "story in this section of the text is narrated in a sequential, or chronological, fashion according to the dates of each event." Students will draw a Venn diagram in their social studies notebooks. Using the Venn diagram, students will compare and contrast two major leaders in Jewish history. Compare and contrast the historical significance of Abraham and Moses in Jewish History. Be sure to title your diagram. Be sure to add as many details from the text as possible. Write the page number and paragraph number next to each of the facts that you find. If you are quoting directly from the text be sure to use quotation marks. Be sure that the facts that are chosen for Abraham and for Moses compare and contrast the historical significance of both leaders in Jewish History. This is to be completed for homework and will be graded. Homework Due Friday, February , : Compare and contrast essay, Leaders in Jewish History, pp. 202-205, complete on loose-leaf. Students have already read pages 202-204 in the social studies text book and have already created a Venn diagram that compares and contrasts two major leaders in Jewish history. The Venn diagram that was created last night for homework compares and contrasts the historical significance of Abraham and Moses in Jewish History. Students will write an easy to compare and contrast the historical significance of both Abraham and Moses in Jewish History. Also, you will compare and contrast the author's purpose for presenting the information about each Jewish leader. Compare and contrast how the author presents the information: in chronological order, narrative form, or as a persuasive piece. Answer the following question in your essay: How does the way the author presents the information help us determine the author's purpose? This essay will focus on all of the steps of writing an extended-response essay that we have discussed and practiced in writing class. Homework Due Tuesday, , : The Hebrews and Judaism, Guided Reading Worksheet, section 1, pages 73-75. In pairs, students will read the Guided Reading Worksheet, Section 1, pages 73-75. ***Students will follow the instructions in the margins of the worksheets. Be sure to annotate as you read. Complete page 75 of the Guided Reading Worksheet. Students will have the entire class period to finish this assignment. Homework Due Wednesday, February 25, : Finding the central idea, pages 205-207. We will go over the main points of the similarities and differences between Abraham and Moses. Students will read pages 205-207 in the social studies text book. After reading, students will write the central idea of each section. Using the headings as a guide, students will write the central idea of the information that is found under each heading. Be sure to have a sentence for each of the headings, including the headings in blue and red. Students will be writing the sentences in their own words and will not be using quotations. Homework Due Thursday, February 26, : Pages 208-210, list of Jewish beliefs. Students will read pages 208-210. Write a list of the main Jewish beliefs that are listed in the text. Write the central idea next to each of the main Jewish beliefs. Give an example of each belief. We will go over the directions for Thursday assignment. Thursday's assignment is due Friday. Homework Due Monday, March 9, : Complete pages 79-80, The Hebrews and Judaism, Section 3 packet. Begin studying for the test. The test will be Thursday, March 12, 2015. Students will annotate as they read pages 79-80, The Hebrews and Judaism, Section 3. Homework Due Wednesday and Thursday, March 12, : Study for test. Classwork: Tuesday, March 11, . Review for the test. Homework Due Friday, March 13, : Make corrections on the test that was given back in class today. HAND IN BY 8:00AM. Students have the opportunity to correct the mistakes that they have made on the Chapter 7 test. Students will make the corrections NEXT TO THE ANSWER THAT WAS WRONG. Using a marker to make the corrections makes it easier for Mrs. Looney to see the correction. In order to receive half of the points back, students must hand the test back by 8:00 tomorrow morning. In order to receive half of the points back, students must write the page number of where the correct answer was found next to the correct answer. Due day, March , 201: Homework: Make corrections to your social studies test in order to gain points on the test. Classwork: Thursday, March th. Map Activity, Jewish Migration After AD 70, pages 16-17. As a class, we will go over the instructions to the Map Activity. Students will have the class period to complete this work. Students will complete the Map Activities numbers 1-5. Students will complete "Analyzing Maps" questions 1-4. The "Extension Activity" may be completed. Extra Credit Due sday, March : Homework: King Solomon Essay. Classwork: day, March , 201. Students will read the "King Solomon" article. Students will answer the two questions in essay form. Take the time and put extra effort into making sure that you use plenty of evidence AND EXPLAIN THE EVIDENCE WELL! Please note: see the "Sixth Grade Writing, Unit 5, Prompted Essays, text-based" page for information about the "Esther, Queen of Persia" article and essay assignment.Classwork: day, March , 201. As a class we will read and discuss pages 214-219. Homework Due Tuesday, Wednesday, Thursday, Friday, February 2, 3, 4, 5, : Due to Project Know, the 6th Graders will not have homework in social studies this week. Due to Project Know, Mrs. Looney will only be meeting with the third period 6th Grade Social Studies Class this week. The third period social studies class will create a special PowerPoint that will help depict the vocabulary words for this chapter. Students will present their PowerPoint presentations to the class. Students will create a quiz for the class using the vocabulary words. Students will act out the vocabulary words to help the class understand the words more fully. Homework Due Wednesday, February , : Section Quiz, Section 1, page 109. Students will be given the homework at the beginning of class. THIS IS FOR A GRADE. Also, complete pages 200-201, Facts and Opinions about the Past, questions 1-4. Students will complete the handout "The Hebrews and Judaism, Section Quiz, Section 1, page 109." Students may work in small groups to complete the task. Students will use their social studies text book to find the answers. What part of the text book will you use to find the answers? They will have the entire class period to finish the assignment. Each student will be responsible for teaching the class one of the definitions. The word and definition should be written out for the class to see. Illustrations may be included. Words and definitions could also be acted out to show the meaning. Homework Due Friday, February 27, :The Daily Bellringer assignment, Chapter 7, Section 2 handout and essay is due Friday at 8:00. The essay is to be completed on loose-leaf. In pairs, students will take turns reading the quotes that are found on the handout "The Hebrews and Judaism, Daily Bellringer, Chapter 7, Section 2. The group members will try to guess who is "speaking." Write the name of the speaker next to the number. Use your text book. Write the number of the page on which you found your answer next to the answer. In essay form, write an opinion letter to your neighbor explaining your belief in kindness and explaining why you think your neighbor should be kinder to his slaves. See the Daily Bellringer sheet for more details.